How to find the rat or mouse for you! Do you have the proper cage, accessories, and knowledge needed to care for your pet. What personality traits do you want in your new pet. Is the color/coat type important. Do you have any future breeding or showing plans for your new pet. There are many ways to acquire a rat or mouse. The method you choose, and the time and energy you put into the decision, may make the difference between having a healthy, loving pet or having a rat or mouse with major medical and temperament problems. Before beginning your search for a rat or mouse, ask yourself the following questions. What type of personality do I want in my pet (calm, excitable, loving, gentle, tolerant, etc.)? Does it matter what color/coat type my pet is, and if so, what are my preferences? Do I want a male or female, or does it matter? Do I also plan on showing and possibly breeding my pet? Buying from a reputable breeder is the best place to get a rat or mouse. Responsible breeders focus on producing healthy animals with great temperaments. They handle their babies from birth, feed complete and wholesome diets, and do not use cedar or pine bedding. One advantage to buying from a breeder is that you often have the opportunity to see and/or handle the parents of your rat/mouse. Often, babies pick up much of their personalities/temperaments from their parents. Breeders also know the background of their animals and are a good source of information on the longevity and likely health problems in a particular line. 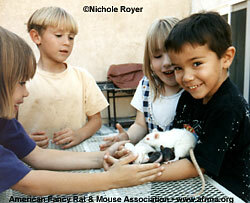 Those of us who live in Southern California are lucky as there are lots of rat and mouse breeders around. Those people living in other parts of the country may have a much more difficult time finding one. AFRMA has the names of many breeders all over the world. Check out the AFRMA breeders’ page and links page. Not all breeders are reputable. Some breed animals simply because they can make money selling the more unusual colors. Others seem to enjoy producing huge numbers of babies, and give no thought to their care, health, temperament, or eventual placement. Responsible breeders only breed to improve on the animals they already have. Most will not consider breeding an animal if its health or temperament are in question. They will be happy to discuss the animal’s background, parentage, and lines. They may insist that you own more than one rat/mouse, or that you not use specific kinds of food/bedding, you may be asked questions about what kind of cage you have, the ages and number of children in the family, and your past pet history. The breeder is not being nosy, they are instead trying to be sure their baby is going into a suitable home. Most breeders will allow you to see their rattery/mousery. While there, use your eyes and nose. Any enclosed space with a large number of animals in it will have a bit of a “critter” odor (particularly if the residents include male mice); however, the smell should not be overpowering, nauseating, or make your eyes water. In particular, if there is an ammonia odor, the husbandry of that breeder comes into question. Do the animals look healthy and come out to see what is going on (midday they are likely to be slower about doing this)? Do they act like they are familiar with being handled regularly? Does the breeder handle them without fear? Do they have food and water readily available? There are a few breeders who will not allow anyone into their rattery/mousery. Often, this is done to protect their animals, after all, a “visitor” is the most likely carrier of potentially harmful germs. In this case, you will have to use the condition of the animals you are shown, and the breeder’s reputation, to make a decision if this is the breeder for you. If you are buying a pet, temperament and health should be your primary concern. Visit several breeders and handle a number of animals, then pick the one that is the most appealing to you. If you are buying an animal to show, you will have to rely on the breeder for an educated recommendation on which animal to choose. Your choices will be limited to a few breeders and the animals they have on hand at the time you are looking. Most breeders will give you an honest opinion and spend time explaining why they recommend one animal over another. Don’t expect a breeder to sell you pick of the litter — they usually keep that baby themselves; however, most will go out of their way to make sure someone starting out in the fancy gets good show-quality animals. They will continue to be a good source of help and information for as long as it is needed. Here in Southern California, we are spoiled. There are lots of different breeders and almost any color/coat type wanted can be found. In other parts of the country, breeders are much more difficult to find. AFRMA has a list of breeders. While breeders are by far the absolute best option for finding that perfect pet rat or mouse, it is true that in some areas they are nearly impossible to find. For this reason it may be necessary to look to a pet shop as the only possible source of obtaining your new rat or mouse. There are many problems with obtaining any animal from a pet store. In the case of rats and mice, most pet stores obtain the animals they have available from commercial “producers.” The vast majority of these individuals are making a living breeding animals for the pet shops. In order to do so, these animals are produced with as little monetary and labor input as possible, which often leads to animals who are neither physically nor emotionally healthy. They are often sent out to the pet shops when they are very young and not yet ready to be weaned, often as young as 3 weeks. Not the “perfect pet” by anyone’s standard. Unfortunately, every animal purchased from a pet shop is money going straight into the hands of the “producers” who will continue mass-producing animals under very bad conditions to fill the need. If you do decide that your only option is a pet store, please be prepared. In the course of looking it is very likely you will find animals that you feel very sorry for. Often these animals are sick and bringing one home creates a heartbreaking situation. Many (most) rats and mice are ill before they ever leave the commercial supplier’s premises, and even the healthy ones quickly can become sick under the stressful conditions present in the majority of pet shops. If you already have a rat or mouse at home and are in search of a friend, please remember that any animal brought in from a pet shop will need to be completely quarantined for 8 weeks. Even at that, there are some viruses that can make your current pet fatally ill just by the newcomer being in the same house. When buying from a pet shop, your prime consideration will need to be health and temperament. Color should become unimportant right up to the point that you find a suitable group of animals to pick from, and the chances of finding an animal which can be shown are next to none. Because their backgrounds are totally unknown, I also recommend never breeding an animal obtained from a pet shop. Your major challenge will be finding animals which are healthy enough to consider. Visit all of the pet shops in your area and become familiar with their animals. Ask questions. Sometimes you may be pleasantly surprised that a pet shop owner knows of a local person with a litter of babies. That is usually a better option and at least worth checking out. Consider the health and living conditions of the rats and mice at all the local pet shops. Do they have adequate food and water? Do the animals look healthy and active? Do you see sneezing, runny eyes, lethargic animals, animals that are very young, or any sign of parasites? Ask to handle the animals and hold them up to your ear while listening closely. Do you hear any rattling?? If so, that animal has a respiratory problem. Are the animal’s coats thick and shiny? Do you see bald or thin spots? Part the hair and look at the animal’s skin. Is it clean? Do you see any tiny specks that look like dirt but which move on their own? If you do, that animal has parasites. If you are buying a pet, temperament and health should be your primary concern. When you find a pet store (or if you are lucky, a couple of them) which appears to have healthy animals, ask when their next shipment is coming in. Go down the day it is due and look over the animals. Check their health again, paying particular attention to any signs of respiratory or parasite problems. With these problems you can assume that if one has it, they all have it. Also see if they appear old enough. It can be hard to tell, but typically if a rat or mouse looks like a real “baby” or is very small, it is too young. A good gauge is to check and see if the little one’s head appears too big for its body and if the coat seems “fuzzy” when compared to older animals. Younger is not better in this case, the stress of the whole experience often makes the real youngsters highly susceptible to all sorts of nasty things. If the group of animals seems healthy, make an attempt to assess their temperaments. They have most likely never been handled much in their short lives, so don’t expect them to be extremely snuggly . . . in fact, that in itself can be a sign that there might be a problem. While they may be nervous of you, rats with good temperaments will allow you to pick them up without screaming, and will not jump frantically from your hands. They also will make no attempt to bite. It’s much harder to find pet shop mice who will not act in this fashion; however, you should be able to pick them up by their tails and place them on your hand without them freaking out or trying to bite you. Biting of any sort is totally unacceptable. Needless to say this is a lengthy process. You may have to look at numerous groups of rats or mice before finding one that is both healthy and has a good temperament. The time will pay off though, in the health, temperament, and longevity when you finally find your new friend. Whether you live where you can go to a breeder, or are forced to go the route of braving the pet stores, please remember: bringing an animal into your home is a commitment which should not be taken lightly. Our small friends are only with us for a short time. It is our responsibility to be sure that they are taken care of to the best of our abilities. Are you ready to own a pet rat or mouse? Are you willing to spend a minimum of ½ hour a day with your pet? Are you willing to clean its cage once a week or more often if necessary? Are you prepared to go out of your way to obtain the correct bedding and food for your pet? Have you bought and read at least one book about rats or mice? Will you take your rat or mouse to a veterinarian should it become ill? Will you check your pet’s food and water at least once a day to be sure it has both in adequate supply? Have you thought about who will care for your rat or mouse when you go on vacation? Are you prepared to spend at least $60 on an initial cage set-up for your pet rat, $30 for your pet mouse? Are you prepared to accept full responsibility for your pet for its entire life? If you answered NO to any of these questions, please rethink your idea of getting a pet rat or mouse.